Russian President Vladimir Putin is holding his annual marathon Q&A. He is expected to touch on a variety of themes during a year of great economic and geopolitical turbulence. So that wraps things up for another year. The president faced a total of 53 questions over three hours and 10 minutes - and no surprise pardons on the way out! Putin wishes everyone a happy New Year and concludes the press conference, which ran an hour less than the previous year. The biggest shock of the Putin press conference: it was shorter than last year's. Just a little over three hours. Putin says that in the end, Russia will be stronger, both economically and in the international arena, despite the problems it is facing today. Putin once again says that providing for the welfare of people is the most important goal of all. He says the government will adjust pensions for the actual inflation rate. He says that economic growth is "inevitable", as the rest of the globe is growing economically as well. "We are all going through a very difficult time due to objective and subjective circumstances." 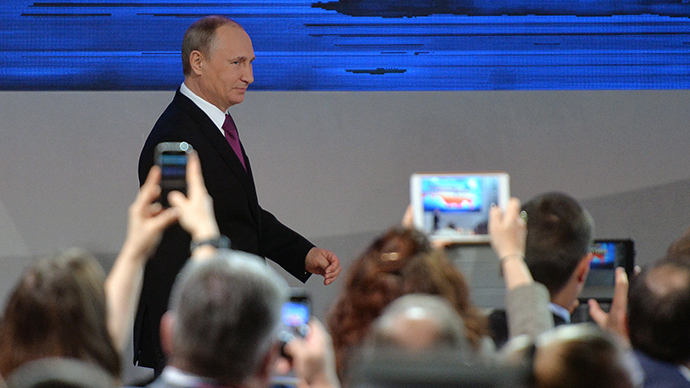 Putin says the economy will adapt to the new situation, which has been partially sparked by low energy prices. Putin is asked if he should be held accountable for the current economic problems, including the fall of the ruble. He is further asked about plans to run for president again. Putin says it is too early to talk about who will run for president in 2018. Regarding the economy, he says the head of state is always responsible, and that everyone makes mistakes. He reiterates that the government is doing very well in addressing the current issues that Russia is facing.